Gypsum is a very soft mineral composed of calcium sulfate dihydrate, with the chemical formula CaSO4·2H2O. 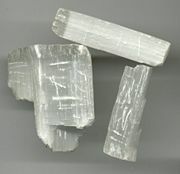 It is widespread in nature and is often found in salt deposits along with other minerals, including its anhydrous form (CaSO4) known as anhydrite. When heated under appropriate conditions, gypsum forms plaster of Paris. Gypsum is extremely useful for many practical applications and for works of art. In particular, it is used for wallboard for buildings, as a component of concrete for the construction of highways and bridges, and as a soil conditioner for agriculture. The translucent variety, called alabaster, is a valuable ornamental stone. When converted to plaster of Paris, it is used in sculpture, architecture, fire protection, and theatrical sets. The word gypsum is derived from the aorist form of the Greek verb μαγειρεύω, meaning "to cook," referring to the mineral that was heated to drive off much of the water. This "burnt" form of gypsum, long obtained from the quarries of the Montmartre district of Paris, came to be called "plaster of Paris." Gypsum is a common, rock-forming mineral, with thick, extensive beds formed by the evaporation of extremely saline waters. It is often associated with other minerals, such as halite and sulfur. It is deposited from lakes, seawater, hot springs, volcanic vapors, and sulfate solutions in geological veins. Hydrothermal anhydrite in veins is commonly hydrated to gypsum by groundwater in near-surface areas. The largest known deposits of gypsum occur in strata from the Permian age. Gypsum from New South Wales, Australia. Given that gypsum dissolves over time in water, it is rarely found in the form of sand. An important exception is the White Sands National Monument in the state of New Mexico (in the United States). The unique conditions there have resulted in a 710 square kilometer (275 square mile) expanse of white gypsum sand, enough to supply the construction industry with drywall for 1,000 years. Commercial exploitation of the area, strongly opposed by area residents, was permanently prevented in 1933 when President Herbert Hoover declared the gypsum dunes a protected national monument. Commercial quantities of gypsum are mined in Germany, Italy, England, Ireland, Canada, and the United States. In Canada, this mineral is found in British Columbia, Manitoba, Ontario, Nova Scotia, and Newfoundland. In the United States, gypsum is produced in the states of New York, Michigan, Iowa, Kansas, Oklahoma, Arizona, New Mexico, Colorado, Utah, and Nevada. There is also a large mine at Plaster City in Imperial County, California. In addition, commercial quantities are found in East Kutai, Kalimantan (Indonesian Borneo). In nature, gypsum occurs in a variety of crystalline forms, noted below. The pure crystals are colorless and transparent. This mineral has insulating properties and feels warm when touched, as compared with other minerals. Heating it to 300 °F drives out much (75 percent) of the water content, producing plaster of Paris. Further heating (at 350 °F) drives out the remaining water to produce anhydrite. Gypsum occurs in nature as flattened crystals that are often twinned. In addition, it may be found as a transparent, colorless variety with a pearly luster, called selenite. If it is in a silky, fibrous form, it is called satin spar. Alternatively, it may be granular or quite compact. In hand-sized samples, it can range from transparent to opaque. A fine-grained, white or lightly tinted variety of gypsum is called alabaster, which is prized for ornamental work of various types. 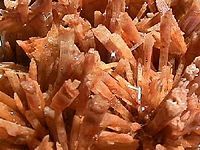 In arid areas, crystals of gypsum (or barite) can assume a flowerlike formation with embedded sand grains. 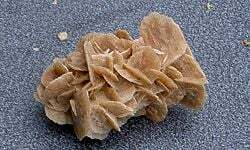 This structure, which is typically opaque, is called desert rose. Around the world, gypsum is extensively used in concrete for the construction of highways, bridges, and various other structures. In the United States, it is a major component of wallboard for homes and other types of buildings. It is also widely used as a soil conditioner for agricultural lands. In the form of plaster of Paris, it is used in sculpture, architecture, fire protection, and theatrical sets. The alabaster variety, which may be stained in different colors, is a highly regarded ornamental stone. ↑ James Abarr, "Sea of Sand," The Albuquerque Journal (Feb. 7, 1999). Retrieved April 17, 2007. ↑ Minerals and Mining. 2005. "Mines, Quarries, Pits, Bogs, Mills and Concentrators in Canada - Gypsum." Natural Resources Canada Retrieved April 17, 2007. Founie, Alan. 2007. Gypsum: Statistics and Information. U.S. Geological Survey. Retrieved April 13, 2007. Klein, Cornelis, and Barbara Dutrow. 2007. Manual of Mineral Science, 23rd ed. New York: John Wiley. ISBN 9780471721574.